People seem to confuse “labyrinth” and “maze.” They are both constructed paths you have to walk and they both have beginnings and ends, but their purposes are very different. I am coming to the conclusion that I am living my life in a labyrinth…or at least I want to be. So what’s the differences between them? Let me list the ways…. A LABYRINTH is a spiral walking path. A MAZE is loaded with compartmentalized confusing paths, most of which lead to dead ends. The goal when you walk a LABYRINTH is to follow the path to the center, stop, turn around and walk back out. The objective when you enter a MAZE is to escape as soon as possible. A LABYRINTH is actually a form of moving meditation. A MAZE is an analytical puzzle to be solved. A LABYRINTH is a form of moving meditation. A MAZE is meant to be disorienting. You can lose yourself in a LABYRINTH; you can get lost in a MAZE. A LABYRINTH can shift consciousness from linear to non-linear thinking. Usually a MAZE engenders the I-hope-I-make-it feeling. 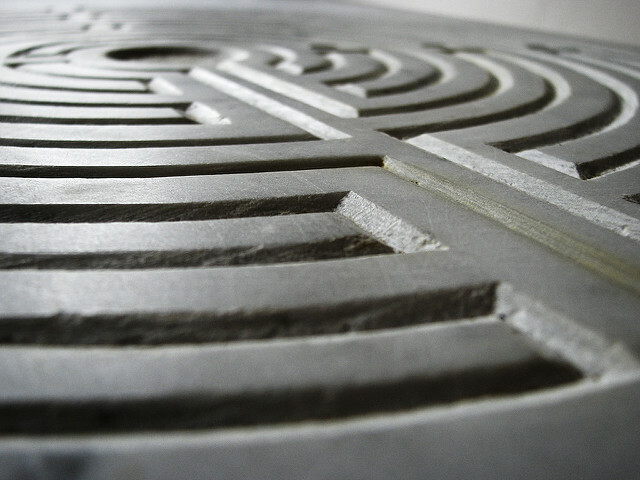 A LABYRINTH is about journey and is a metaphor for walking through the Void. The purpose of a MAZE is to get through to the other side. It’s a funny thing. When you lay it out like that, you can actually suss out that doing the MAZE thing as a way of life is probably toxic. I mean, they use mazes to test and play head-games with rats. 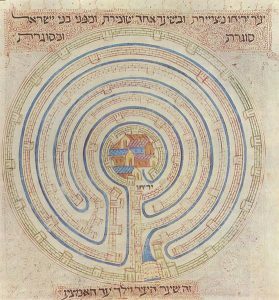 Through the ages, for more than 4,000 years, people have been fascinated with labyrinths. 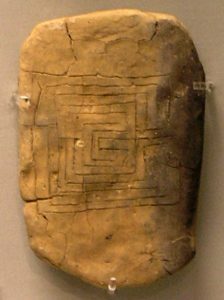 Here is the reverse of a clay tablet from Pylos with the motif of the Labyrinth. The terracotta tablet is the earliest datable representation of the 7-course classical labyrinth. It was recovered from the remains of the Mycenaean palace of Pylos, destroyed by fire ca 1200 BCE. “There is no evidence for a connection between the labyrinth design and the legend of Theseus at this early date,” it says here. The tablet is currently in the National Archaeological Museum in Athens. The story that’s associated most closely with the labyrinth is the legend of Theseus and the Minotaur. In Greek mythology, the labyrinth was an elaborate structure at the palace of King Minos of Crete at Knossos. It was designed and built by Daedalus, the king’s legendary architect and artificer. It is said that Daedulus had a hard time figuring out how to get out of the labyrinth once he had built it, which tends to make me think that the thing was actually an elaborate maze. Whatever. In the story, the labyrinth was built to contain a monster-man that was reputed to be the son of the king’s nymphomaniac wife by the Sacred Bull. (No, I am not going there….) 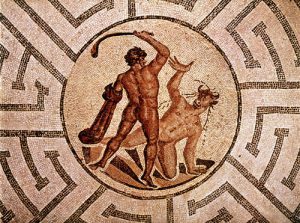 Minos, a classic tyrant, used to exact tribute from the neighbors, hauling off their young men and women who were pushed into the labyrinth, probably as food for the Minotaur. The Minotaur was killed by the hero Theseus. This Roman mosaic shows Theseus at his moment of triumph. The picture’s apparently the work of an anonymous U.S. government employee. The mosaic is in Rhaetia, Switzerland. Labyrinth designs have been found in many different cultures. 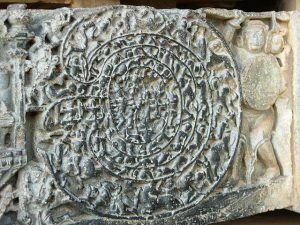 This intricate carving depicts a scene from a legend from the Mahabharata, where the warrior Abhimanyu enters the chakra-vuyha-Hoysaleswara temple in Halebidu, India. The following map of Jericho was photographed from a page in the 14th century Fahri Bible written by Elisha ben Avraham Cresca. Another labyrinth…. And here’s a surprise: a labyrinth stone in America…. In the Reinhardt Canyon on the easterly side of the Lakeview Mountains in Southern Calfornia, there’s a prehistoric petroglyph near Hemet, Riverside County, California. 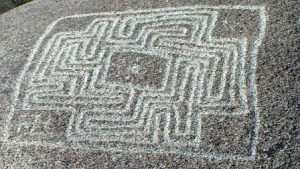 It’s a California Historical Landmark and is called the Hemet Maze Stone. Many cathedrals have labyrinths incorporated in their design. 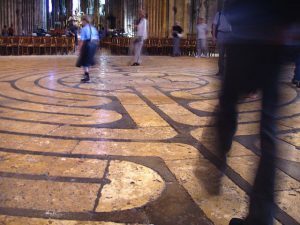 One of the most famous is the labyrinth at Chartres Cathedral in France. 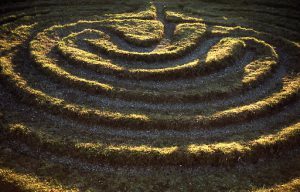 Now there are non-profit groups and websites that focus on the labyrinth as a tool for getting back to your own center. 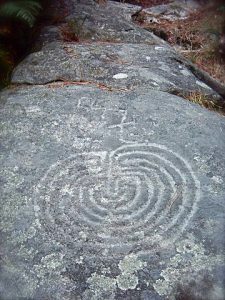 Public spaces have been built that incorporate the labyrinth in their design and a slew of books have been written telling folks how they can use the ancient design to walk around in their own minds. Labyrinth jewelry and paraphernalia proliferate. However, using the curving pathways of a labyrinth to help you visualize an inward journey that leads to the center of your being and then out into the world again is a powerful metaphor that apparently works for many people. My take on all this is that people are hungry to find peace of mind. The Labyrinth Movement and all things labyrinth is a direct outgrowth of that hunger. And reverence the truths, the love you feel. Inside the ordinary simple and the small. As the magic in the silence of the stars. And papas cradling babies tenderly. The many songs that water sings…all call to me. Its many moods and modes and ways of being. I cannot turn away, no matter what the wise ones say. For me, the world holds everything that’s dear. I do not doubt they reached magic and the Real. They flew up high above all the tangles. The confusions that plague me, I know they did not feel. Way more interesting than the ones in me.